Dalo’s Ethiopian Kitchen, the restaurant anyway, has been gone a while and maybe it should not have been a surprise given the dramatic sweep of new buildings that have been taking over North Williams Ave. From the outside it never looked like much, nondescript and in a building that housed the Oregon Minority Entrepreneurs Association. Inside it was like any Ethiopian restaurant with Ethiopian music, Ethiopian travel posters and a bar towards the back. It was a bit dingy but the food was good. It seemed to be run by an older, bubbly gentleman and his harried son. You never wanted to order off the menu, not after they started the buffet service, because it seemed to take hours to get food. Now time isn’t so bad when you just want to hang out with friends but hours, and yes it’s an exaggeration, when I’m thinking multiple hours it was probably closer to 2 than 3, but there is only so much time that can be spent in a restaurant waiting for food or the check. The buffet on the other hand was easy. There was a sink ten feet away so you could wash your hands, important when you’re eating with them, otherwise you had to grab the key and walk down the hall to a shared bathroom. The buffet was good for eating in or loading up serving savers for carry out. 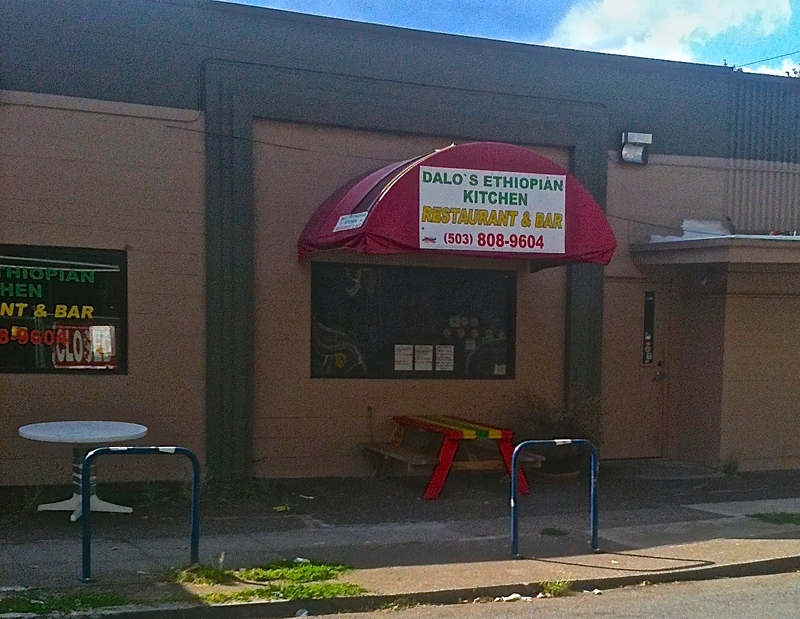 Dalo’s Kitchen made me realize that there are varying ways of preparing Ethiopian food, different items, a variety of dishes with every restaurant providing their unique take on what Ethiopian food can be. I drive up North Williams sometimes when I pick up carry out from Queen of Sheeba, another Ethiopian restaurant. I’ve lived in Portland long enough to remember when North Williams was more empty lots than condos but I can’t get nostalgic about the old Hostess store. The construction boom was a bit of a shock after years with nothing much going on or going up. A recent ride up Williams on my bike had me spotting 20 or more construction workers on a lunch break. Changes to the area like the addition of New Seasons and other new businesses and restaurants as well as North Williams now having one of the automobile lanes reserved for bikes have made the street more active. It feels like it has the potential to get congested but most of the time I’m passing through. I miss Dalo’s in it’s old spot. When I saw it had been demolished it was disconcerting but there were buildings going up on all sides so why wouldn’t there be a new big building there too. Dalo’s Kitchen has a food cart in Alberta. The website points out you can “find us next to the New Rose City Cab Co.” The optimist in me has Dalo’s Kitchen becoming a restaurant again and returning to some nicer digs. The Oregon Minority Entrepreneurs Association has a fine new office set up in Hayden Meadows in the Delta Park area so maybe all hope is not lost. In the meantime I have to hit the cart not only for the food but maybe to see if I can find the bubbly old man and his harried son. Anybody know how to get to the New Rose City Cab Company? Bukum Cafe in Adams Morgan has that savory Ethiopin chow when I get a hankerin. I bet Jerome Kersey liked some late night Ethiopian grub. Sad to lose him . Keep up the work, good. Our Ethiopian places are all over town not concentrated in one impossible to park section of town. It’s a bummer to lose even one of them. I’m not sure how much Ethiopian Jerome Kersey ate living in Lake Oswego but from what I’m hearing from responses to his passing he seemed like a really special guy. I just seemed to confuse him with a football player with a similar name.